WASHINGTON — The ghost of weakening Tropical Depression Florence will bring showers and a chance of thunderstorms to the D.C. area on Monday, exactly 14 years after another tropical cyclone gave rise to the largest tornado outbreak on record for Virginia. Florence has produced rainfall totals in excess of 20 inches since it made landfall near Wrightsville Beach, North Carolina, as a Category 1 hurricane. After tormenting the Carolinas, the stalled tropical system responsible for widespread flooding will finally gain forward speed as it begins to track north and eastward. As the decaying storm lumbers toward the Appalachians and the mid-Atlantic, scattered showers are forecast to increase in coverage throughout the day on Monday. Flash flooding is possible as any showers and storms that develop could produce heavy rain. More than 50 tornado warnings have been issued by National Weather Service offices in three states since Florence forced its way inland. There is a slight chance of an isolated, weak tornado or two on Monday. Landfalling tropical systems are known for their ability to produce tornadoes, some more than others. In 2004, the remnant circulation of Hurricane Ivan spawned more than 100 twisters across several states, including Maryland and Virginia. The tropical cyclone’s strongly sheared winds spread over the D.C. region on September 17, 2004. By the midafternoon hours, dozens of rotating thunderstorms had formed. Several of the day’s tornadoes were strong, with winds up above 100 mph. 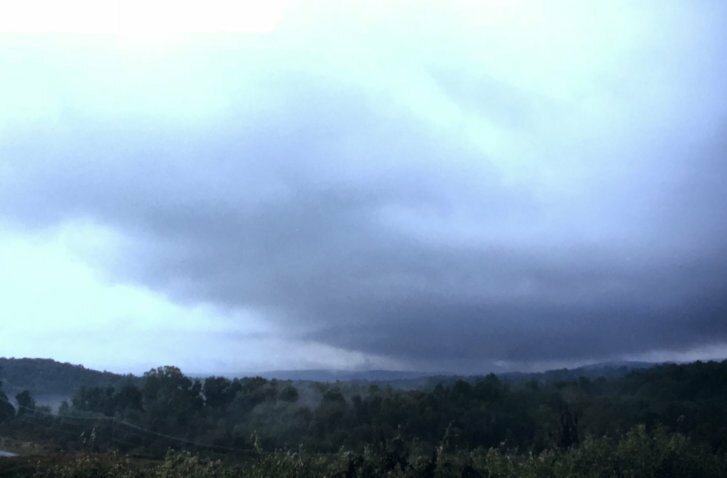 More than three dozen twisters touched down in Virginia, including a violent F3 tornado in Fauquier County. Dozens of homes sustained damage in Remington. It was the Commonwealth’s largest tornado outbreak in recorded history. An F2 tornado tracked due north from Chantilly past Dulles International Airport into western Montgomery County, where numerous structures were damaged in Poolesville before the twister lifted.